The wire and cable industry is going through a diverse phase in different regions of the world. The presence of developed countries in North America and Europe have made them mature regions of the wire and cable market. On the other hand, developing countries in Asia Pacific and Middle East & Africa that are undergoing new residential and commercial infrastructure development and a corresponding expansion in power networks are driving the global wire and cable market. The market is projected to expand at a CAGR of 4.1% during the forecast period to reach US$ 235.9 Bn by 2026. Increase in global population and urbanization are resulting in development of new residential and commercial properties. According to United Nations Organization, around 54.5% of the global population lived in urban settlements in 2016, and by 2030, urban areas are projected to house 60% of people globally, and 1 in every 3 people will live in cities. Branch circuit wiring is used in every building to carry electrical current to all external uses of power. Also, new power transmission network is required for newly constructed residential and commercial buildings. Moreover, increasing government initiatives for the renewal of existing power transmission and distribution network is further speeding up the expansion of wire and cable market due to urbanization. The transport industry has also been favorably influenced by rising urbanization and globalization. Transport systems that enable mobility make use of several wires such as brake wires, clutch wires, gear wires, accelerator wires, etc. Technological advancements and increasing disposable income of consumers have resulted in increased spending on automobiles that offer safety, comfort, and stylish features. This has led to high production of autonomous driving vehicles and intelligent networking of vehicles. These vehicles incorporate reliable and fast transmission of large data volumes between control units, sensors, and vehicle components and thus require high quality special cables and safe wiring architectures. Therefore, in order to cater to demand from the automobile industry, companies are further developing fail-safe wiring & cabling system architectures, thereby aiding the expansion of the wire and cable market. Apart from urbanization, industrialization is another key factor directly affecting the wire and cable market. The demand for flexibility and customization of wires and cables is increasing within several industries owing to the growing complexity of product manufacturing. Moreover, rising demand for electricity, particularly in developing and underdeveloped countries, due to rapid industrialization and the increasing usage of renewable energy for the same are facilitating rise in use of wires and cables in industries. In the global wire and cable industry, copper is expected to be the most preferred material across the world. Although aluminum is expected to substitute copper in a few applications, it is anticipated to maintain its dominance in buildings and power transmission and distribution networks that make up more than half of the global wire and cable revenue. High electrical conductivity, durability, ability to undergo stress with minimum signs of wear and tear, and superior ductile and tensile strength make copper an irreplaceable material in the wire and cable industry. In terms of type, the optical fiber cable is expected to be largely adopted owing to its advantages such as high bandwidth, resistance to electromagnetic interference, low security risk, and low power loss in long distance communication. Rapid developments in communication technology have led to increased demand for high-performance data and communication applications. As a result, wire & cables manufacturers have been developing new products and systems that can adapt to their varying demands, thus offering numerous opportunities to the optical fiber cable segment. Attracted by this expanding market and underlying latent demand, several players are expanding their business through strategic mergers and acquisitions and partnerships with several end-use industries. For instance, in December 2017, Prysmian group and General Cable Corporation, two leading wire and cable manufacturers announced a merger agreement and expect the deal to close by third quarter of 2018. Moreover, Southwire Co, LLC announced the expansion of DCN Cables, LLC to expand its product portfolio further. Some of the prominent players in the wire and cable market include Prysmian Group, Hengtong Optic-Electric Co Ltd., Furukawa Electric Co., Ltd., Sumitomo Electric Industries, Ltd., General Cable Corporation, Jiagnan Group, TPC Wire & Cable Corp, LS Cable & System Ltd, Polycab Wires Private Limited, Southwire Company, LLC, Hitachi Metals Ltd, Nexans S.A., Leoni AG, and Far East Cable Co., Ltd. This comprehensive report by Transparency Market Research analyzes and forecasts the wire and cable market at the global and regional level. The report provides an analysis over the period 2018–2026, wherein 2018 to 2026 is the forecast period and the base year is 2017. An in-depth and unbiased market assessment has been made to offer readers in-depth and accurate analysis. The report emphasizes on all the major trends and services playing a key role in the wire and cable market expansion during 2018–2026. It also focuses on restraining factors, market drivers, and opportunities of the wire and cable market’s expansion during the said period. 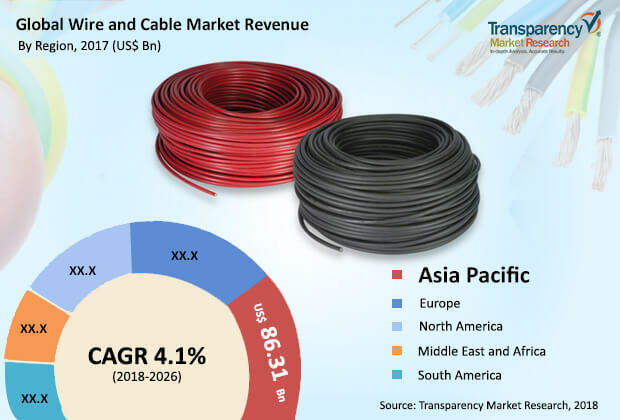 The study provides a complete perspective about the wire and cable market’s expansion throughout the research study in terms of value (in US$ Bn) across various geographies, including Asia Pacific, South America, North America, Middle East & Africa (MEA), and Europe. The report includes detailed value chain analysis, which is focused on presenting a widespread view of the global wire and cable market. The market’s Porter’s Five Forces analysis is also provided to understand the competitive scenario in the global wire and cable market. The study incorporates market attractiveness analysis, wherein the market segments for type, material, and application are benchmarked based on their market size, growth rate, and attractiveness in terms of opportunity. In order to give a complete analysis of the overall competitive scenario in the wire and cable market, every geographic region mentioned in the report has been provided with attractiveness analysis. A market overview chapter in the wire and cable market report explains the market trends and dynamics that include the market restraining factors, drivers, and opportunities for the current and future wire and cable market. A market outlook analysis has also been provided globally in the report. Additionally, the report also provides analysis of different business strategies being adopted by the market leaders of the wire and cable market. The market introduction chapter assists in gaining an idea of different trends and services related to wires and cables along with their types and applications. The study provides a decisive view on the global wire and cable market by segmenting the market based on type into low voltage, medium and high voltage, and optical fiber cable. byIn terms of material, the market has been classified into copper, aluminum, glass, and others. byBased on application, the market has been categorized into building, data transmission, transport, power transmission, and others. The building segment can be further segmented into residential and commercial. The report provides detailed breakdown of the wire and cable market region-wise and categorizes it at various levels, thus providing valuable insights at micro and macro levels. The report further highlights the competitive scenario within the wire and cable market, thus ranking all the major players according to the key recent developments and their geographic presence. The insights for the wire and cable market are the result of our extensive primary interviews, secondary research, and in-house expert panel reviews. These market estimates have been analyzed by considering the impact of different economic, political, social, legal, and technological factors. In terms of region, the market can be divided into North America, Europe, Asia Pacific, Middle East & Africa, and Latin America. The market in Europe can be further divided into Italy, France, Germany, and Rest of Europe. The wire and cable market in Asia Pacific can be further segmented into China, Japan, India, South Korea, and Rest of Asia Pacific. The market in Middle East & Africa covers Turkey, Saudi Arabia, South Africa, and Rest of Middle East & Africa. The market in Latin America includes Brazil and Rest of South America. This report provides all the strategic information required to understand the wire and cable market along with its types and applications. Also, the report provides insights related to the components and different applications according to the various geographical regions mentioned above. The research methodology is a perfect combination of primary research, secondary research, and expert panel reviews. Secondary sources such as annual reports, company websites, SEC filings and investor presentations, national government documents, internal and external proprietary databases, statistical databases, relevant patent and regulatory databases, market reports, government publications, statistical databases, etc. have been used. Primary research involves telephonic interviews, e-mail interactions, and face-to-face interviews for detailed and unbiased reviews on the wire and cable market, across geographies. Primary interviews are usually conducted on an ongoing basis with industry experts and participants in order to get latest market insights and validate the existing data and analysis. Primary interviews offer new and fresh information on important factors such as market trends, market size, competitive landscape, growth trends, etc.. These factors help to validate and strengthen secondary research findings. Moreover, the data collected and analyzed from secondary and primary research is again discussed and examined by our expert panel. The research study includes profiles of leading companies operating in the global wire and cable market. Market players have been profiled in terms of attributes such as company overview, financial overview, SWOT analysis, business strategies, and recent developments. Key players in the wire and cable market are Prysmian Group, Hengtong Optic-Electric Co Ltd., Furukawa Electric Co., Ltd., Sumitomo Electric Industries, Ltd., General Cable Corporation, Jiagnan Group, TPC Wire & Cable Corp, LS Cable & System Ltd, Polycab Wires Private Limited, Southwire Company, LLC, Hitachi Metals Ltd, Nexans S.A., Leoni AG, and Far East Cable Co., Ltd among others. Companies are focusing on expanding their business through strategic acquisitions and partnerships with several end-use industries.